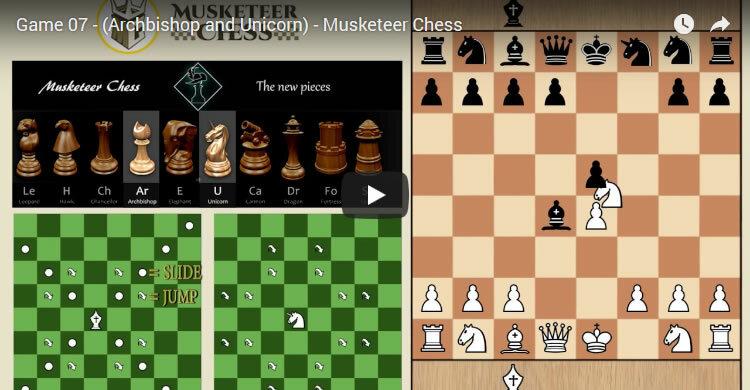 Good example of some “Blitz” attacks using the Leaping pieces in Musketeer Chess. At a certain point white wasn’t too precise when playing but overall it’s a good game. Special note for the Capture of the Bishop c8. Black’s Archbishop is captured at the same time (only double capture possible during a game) = When you capture a non developed piece (piece B or Bishop) you capture also the piece in reserve (Piece A, here the Archbishop) supposed to enter the game when B first moves !! So be careful of forks or sacrifices permitting such manoeuvres !! Good example of some “Blitz” attacks using the Leaping pieces in Musketeer Chess. At a certain point white wasn’t too precise when playing but overall it’s a good game. Special note for the Capture of the Bishop c8. Black’s Archbishop is captured in the same time (only double capture possible during a game) = When you capture a non developed piece (piece B or Bishop) you capture also the piece in reserve (Piece A, here the Archbishop) supposed to enter the game when B first moves ! !